by Archimandrite Zacharias 463 pgs. Remember Thy First Love is a graphic description of the three stages in the Christian life according to Elder Sophrony of Essex (1896 1993), disciple of St. Silouan the Athonite (1866 1938) and founder of the Patriarchal and Stavropegic Monastery of St. John the Baptist in Essex, England. 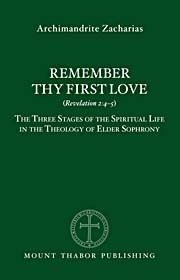 In Remember Thy First Love…Elder Zacharias details the nature and purpose of the first grace given at the beginning of the Christian spiritual odyssey, the experience of the apparent withdrawal of grace, and then our final adoption as children, by which we become heirs of God and joint-heirs of Christ (cf. Rom. 8:17).